Axolotls are great first amphibians for beginners, because they are relatively easy to care for. They are also a very hardy species, so it is unlikely that your pet will become ill. The only thing to worry about with Axolotls is their predatory tendencies. They will generally eat smaller tank mates, and will even eat the limbs of other Axolotls even if similar sized. It advised to keep your Axolotl singly to avoid this, even if the limbs will grow back eventually. Some people may say that it is ok to keep Axolotls with aquarium fish, but this is not advised. Not only is there a chance that the Axolotl may eat the fish, the fish may also try to eat your Axolotls gills causing damage to your Axolotl. An Aquarium will be needed to house your Axolotl as they are entirely aquatic. They are quite an active species so the bigger the aquarium you can provide the better. The aquarium should be fitted with a tight fitting lid, as they are prone to try and escape from their enclosures. Axolotls are not adapted to live on land, so will dehydrate and die quickly if they escape and are not placed back in the water in time. The bottom of the tank may be lined with an aquarium gravel substrate, but larger gravel is more appropriate than smaller grains to avoid your Axolotl from accidently ingesting some of the gravel. Sand, pebbles, marbles and large rocks can also be used. The entire aquarium should be dedicated to providing adequate water for your Axolotl. The water should be at a depth of approximately 25- 30cm (10 -12 inches). Change the water daily to avoid the build up of bacteria, unless a gentle filter can be provided to keep the water clean. Axolotls appreciate a low flow filter as they can become stressed if the flow of the filter is too strong or powerful. With a filter it should only be necessary to change one third of the water every week. De-chlorinated or bottled spring water should always be used as Axolotl are really sensitive to various chemicals and cannot handle water with chlorine and chloramines in. Water should be kept at a PH level of around 7. PH should be checked after each major water change to ensure that a similar PH is always maintained. Axolotls are carnivorous and should be fed every 3-4 days with a varied diet of appropriately sized prey items, such as bloodworms, earthworms, crickets, blackworms, whiteworms, lean meat, small pieces of shrimp, daphnia, mosquito larvae, very small snails and appropriately sized fish pellets. Feed just as much as they can comfortably eat within 10 minutes. Your Axolotl’s aquarium should be inspected daily. Every month (or more frequently if a filter is not used) clean out the tank completely and sterilise using a reptile/amphibian friendly disinfectant. The water needs to be emptied, cleaned and refreshed with fresh de-chlorinated water. Sterilise any décor to replace when the tank has been cleaned. Thorough rinsing is required to ensure that no chemical residue remains on the items to be replaced. Your Axolotl should be moved to a temporary tank whilst being cleaned. Axolotls do not like being handled and handling should be avoided. An aquarium net can be used to move your Axolotls safely to another tank during cleaning, but care must be taken to ensure that you do not damage their delicate gills whilst doing so. There are 5 different colour variations in Axolotls. 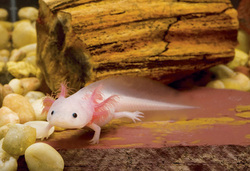 The wild types are either olive green to dark grey or brown, whilst the black, albino and leucistic (golden coloured) Axolotls are more typically found in the pet trade. All Axolotls keep their larval appearance throughout their lives and have 3 noticeable gills branching out from either side of their neck area. These gills have a feathery appearance. Axolotls also have four lizard like legs and a long, flat tail. Axolotls can grow up to 25-30cm (10 – 12 inches). Axolotls can live up to 15 years with appropriate care, but average at about 10 years generally. Axolotls are a fully aquatic species that appreciate heavily vegetated waters and freshwater lakes at high altitudes. They prefer cool water, as the water from the lake of their origin is glacier fed and cool throughout the year.